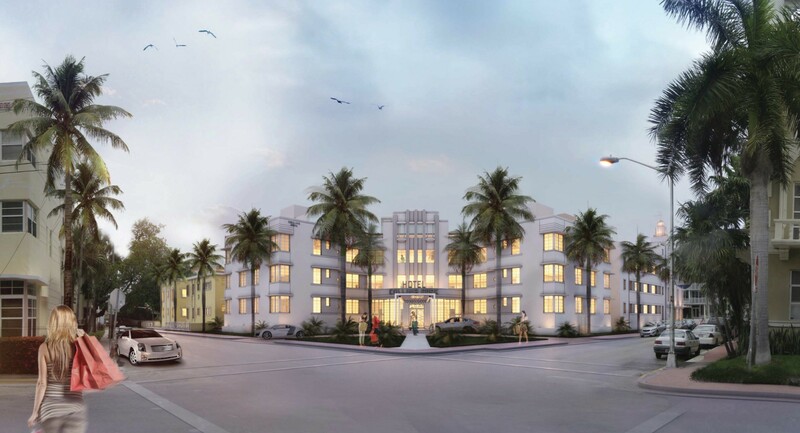 At this month’s Miami Beach Historic Preservation Board meeting, representatives for the developers of the Collins Park Hotel project were forced to ask for after-the-fact approval of demolition on one entire building and features of several others. The project is a large undertaking involving the renovation and restoration of seven contributing buildings, construction of roof-top additions, and a new five-story ground level addition that are part of a new hotel development. It encompasses buildings at 2000 Park Avenue, 2030 Park Ave, 425 Park Ave, 435 20th Street, 430 21st Street, 450 21st Street and 2035 Washington Avenue in the City’s Collins Park Neighborhood. In most cases, due to severe neglect and deterioration, the structures were gutted and their facades propped up as part of the restoration. The properties are controlled by LLCs owned by brothers Juda, Meyer, and Joseph Chetrit. At some point the Sun King #2, a former apartment building that was approved for partial demolition as part of the original Historic Preservation Board (HPB) approval of the development in 2012, was completely demolished without required building permits or an amended approval by the HPB. The Sun King #2 (below) was designed by Milton Sherman and constructed in 1947. In its report to the HPB, Miami Beach Planning Department staff wrote that there was some additional unapproved demolition to a couple of other buildings on the site including decorative architectural elements on the old Collins Park Hotel and side entry porches on the Sun King #1 building. A terrazzo rose compass that was located in the courtyard of the old Adams Hotel has been removed. What raised the issues to the City’s attention was an inquiry by Ray Breslin, President of the Collins Park Neighborhood Association, who was concerned the windows on one of the structures were not correct. When City staff went out to review the windows, they discovered the missing building and other elements. Given the amount of documentation available, Tackett said she is “relatively confident that most, if not all, of these elements that were lost during construction could be reintroduced.” She added that when the HPB approved the project in 2012, “[T]here had already been a significant amount of fire damage done so we weren’t starting in some instances with perfectly pristine public interiors.” At the time, it was anticipated those areas would need to be reconstructed. Trying to explain how the Sun King #2 came down, he described the “very serious neglect” that occurred over a period of twenty years in which the buildings were no longer occupied with the deterioration compounded by arson fires in 2011 that damaged multiple buildings. HPB member John Stuart asked how the Board could avoid being faced with this situation again. She noted that “Some of these buildings are very difficult to shore up due to the nature of the quality of the initial 1930s construction. Going forward we should be looking at those types of details” and including engineers in the original review process to understand complexities and feasibility. Member Rick Lopez wasn’t in such a hospitable mood. “Can someone answer more technically what happened to the building because I’m not really satisfied with your previous answer,” he told Amster. “In these old buildings you find more things than you care to find but still there’s no excuse for that and so the buildings came down,” he said. “It’s my first time doing this and I hope it’s the last,” he said of having to accurately reconstruct buildings that were demolished to a greater extent than approved. Karp said that was not the case. “The goal is to bring it back to its original construction modified as minimally as possible for current building codes,” Tackett said. Marcus has provided photos he took in 1999 before the fires. Board Chair Stevan Pardo also pressed on how to prevent “unintended” demolitions in the future. He agreed with Tackett on doing further analysis of the feasibility of projects but that is before permits are pulled, he said. How, he asked Karp, do you prevent it from happening once work starts, wondering if having a historic consultant like Marcus on site during demolition would help. One idea, Karp said, is to require cameras on site which they now have on the Collins Park property. He also liked Pardo’s idea for a historic consultant. “We should have someone like an Arthur Marcus on site” to ensure the HPB’s intent is followed. Pardo said, “This is going to be an ongoing dialogue with the City and staff and with us on this project. I don’t want to take away from the beauty and splendor of what this product is going to be to the community… I don’t want to take away from what the applicant has done to date in this City to preserve and protect” historic buildings. With two members absent (Nancy Liebman and Jack Finglass), the after-the-fact demolition required all five members present to vote in favor. On an initial vote, Lopez voted no meaning the motion failed and work would not have been able to proceed reconstructing the lost building and other elements. Breslin asked the Board to reconsider. “They need to move forward. We all need to move forward,” he said. “They can’t move forward restoring the building that came down, however it came down.” Without approval, Breslin said, “You’re stalling the whole project… I hope you reconsider your vote. It’s for our neighborhood and believe me, we’re all going to watch” to ensure it’s done right, he said. Boutsis said the full Board could have a discussion to discuss ideas for increasing scrutiny on future projects. The Board then agreed to Lopez’ request that subcontractors on the reconstruction submit samples and qualifications for the work. With additional conditions such as detailed drawings of the planned restoration for the interiors, no issuance of a Temporary Certificate of Occupancy or final Certificate of Occupancy until the Board was satisfied with the restoration work, a progress report in 120 days, and no parking credits until the Board approved the work, all five members present voted to approve the after-the-fact demolition.